This is probably one of my favourite face masks that i repurchase and always have in my bathroom. If your skin is dry or dehydrated, this mask will boost moisture levels and quench thirsty skin in five minutes leaving your skin feeling replenished and soothed. It contains some great ingredients including vitamin E, white willow extract, urea and marshmallow extract. This mask is suitable for even the most sensitive skins. I can testify to this as i used it liberally post-babies during my most dry and blotchy sensitive skin phase. It has a thick creamy white opaque consistency and a has bit of an ‘old lady’ musty rose scent which isn’t everybody’s cup of tea. It is recommended to use the mask once or twice a week on a thoroughly cleansed face and neck, leave for five minutes and rise with lukewarm water. If your skin is quite dry, dehydrated or sensitized i would recommend applying a thick layer before bed and leaving it overnight to for maximum benefits. It is one of those creamy masks that sinks into the skin so it won’t rub off on your pillows. You will wake up with your skin feeling plumper, nourished and more radiant. 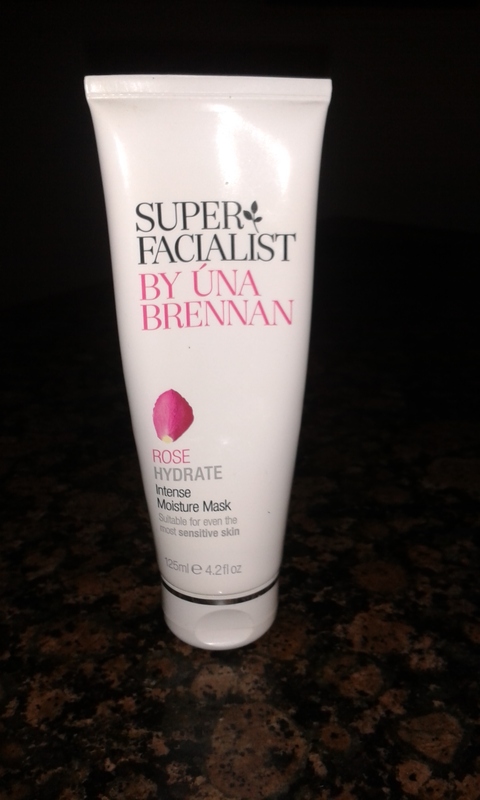 Una Brennan Rose Hydrate Intense Moisture Mask is €11.99, a really great price point for such a good product. I would certainly pay double that and the tube lasts for ages.